The finalists of the tri-series may have been decided but both Australia and Pakistan will be gunning for brownie points and momentum when they face off in the fifth game of the tournament at Harare on Thursday. The game will begin at 6pm (AEST) and you can follow live scores and coverage on The Roar. Two matches played, two matches won. And not just won, Australia have thumped their opponents in those two games, bringing back a hope that was beginning to build during the tri-series that was played around the Tasman earlier this year, in which the hosts won five games in a row against New Zealand and England to win that title. Then, the whole ball tampering saga took away part of that white-ball momentum and the England thumping might have set the Aussies back a tad, but going into this series, there looks to be a quiet confidence building in the team. Sure, beating a second-string Zimbabwe team by any margin might not lie at the top of their best-achievement list but the clinical nature of their victory over Pakistan in the opener pointed in a direction they would have liked. It was the same Pakistan team that had their moments against Zimbabwe in the previous game, needing 19.1 overs to chase down their score of 162. It didn’t look like Pakistan were in trouble at any time during their chase but it wasn’t as easy as Australia had made it out to be when they won their game against Zimbabwe by 100 runs. What will be interesting to see is that Pakistan recalled Mohammad Amir for their previous game and his bowling at the top of the innings against Aaron Finch could hold the key. 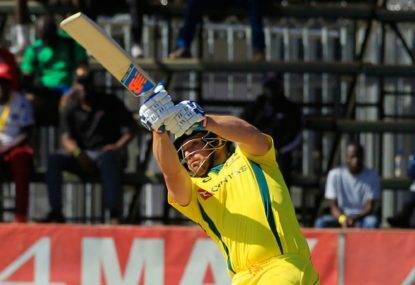 Finch has held the Aussie innings together in both the games and an early loss could expose a line-up that hasn’t been at its best. D’Arcy Short’s struggles at the top, Glenn Maxwell’s poor form and Nic Maddinson’s inexperience could all combine to pose a threat for the Aussies and someone will need to put their hand up and be counted with the bat. Australia to continue with their form in this series and win this one but Pakistan to run them closer than the previous game.